Sharynne McLeod, Ph.D. is a speech-language pathologist and professor of speech and language acquisition from Charles Sturt University, Australia. She is an elected Fellow of the American Speech-Language-Hearing Association and Life Member of Speech Pathology Australia. She is an elected board member of the International Association of Logopedics and Phoniatrics, Vice President of the International Clinical Linguistics and Phonetics Association, a past editor of the International Journal of Speech-Language Pathology and co-chair of the International Expert Panel on Multilingual Children’s Speech. Dr. McLeod has been an invited speaker at the American Speech-Language-Hearing Association conventions as well as at conferences and universities in Australia, Hong Kong, Iceland, Italy, Ireland, New Zealand, Norway, Sweden, Turkey, UK, US, and Vietnam. Dr. McLeod's research focuses on monolingual and multilingual children's speech. She applies the International Classification of Functioning, Disability and Health (ICF-CY, World Health Organization, 2007) to children with speech sound disorders and is one of two speech-language pathologists who contributed to the development of the ICF-CY (WHO, 2007). Her research foregrounds the right of everyone (particularly children) to participate fully in society. Dr. McLeod also researches the prevalence and impact of childhood speech sound disorders and links this to policy and service delivery issues. Elise Baker, PhD is a speech-language pathologist and academic from The University of Sydney, Australia. Dr. Baker has been an invited speaker at American Speech-Language-Hearing Association conventions has served as the National Tour Speaker for Speech Pathology Australia and is a member of the International Expert Panel on Multilingual Children’s Speech. Dr. Baker is an award-winning teacher. 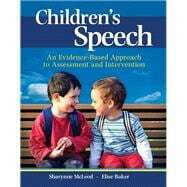 She has taught tertiary students in the area of speech sound disorders in children for over 20 years. She is passionate about speech-language pathologists and researchers working together to foster knowledge creation, dissemination and implementation. Dr. Baker nurtures her passion through service on the steering committee of a large evidence-based practice network of practicing speech-language pathologists. Dr. Baker’s research focuses on intervention for speech sound disorders in children, innovative service delivery solutions for children with speech sound disorders, speech-language pathologists' methods of practice with children who have speech sound disorders, and the conduct of evidence-based practice.